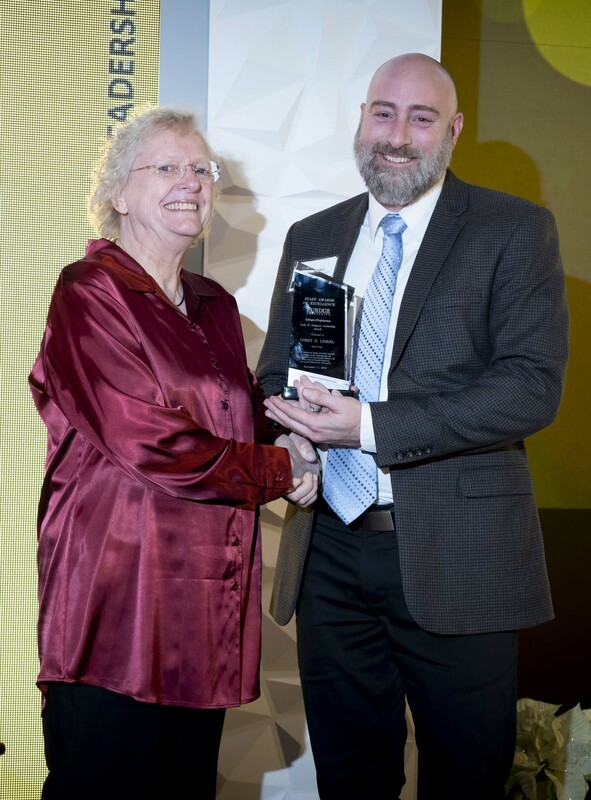 Norvin Bruns and Corey Linkel, two staff members at the Purdue University Weldon School of Biomedical Engineering, received 2018 College of Engineering Staff Awards of Excellence at the annual staff awards banquet held at the Shively Club on December 7. Bruns was the recipient of the New Employee Award; Linkel was the recipient of Leah H. Jamieson Leadership Award. 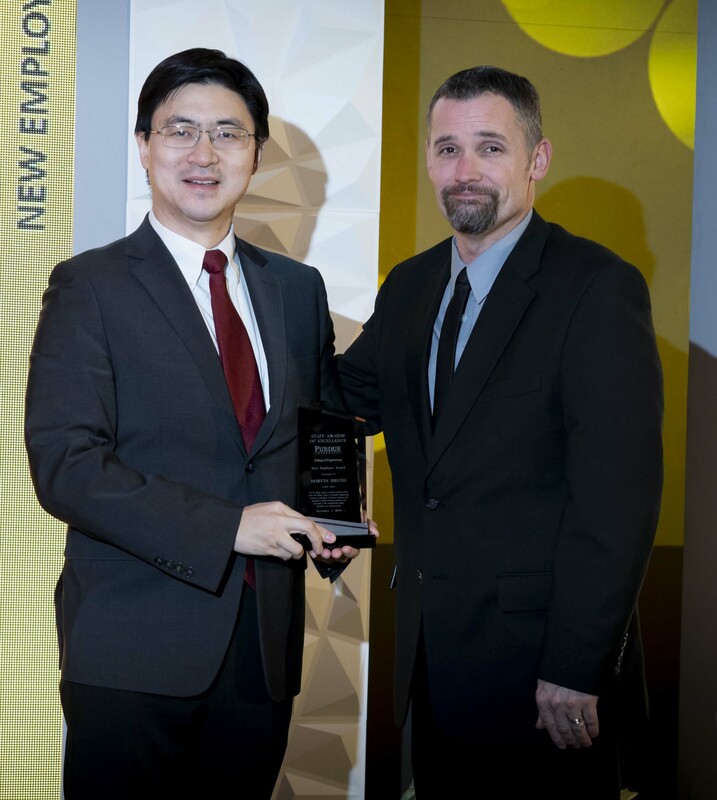 Norvin Bruns (right), Research Shop Technician, receives the New Employee Award from Mung Chiang, John A. Edwardson Dean of the College of Engineering. Bruns acts as the Research Shop Technician in the Weldon School of Biomedical Engineering, serving as an essential staff member with a central role in the activities of the School. He exhibits an intensity and commitment to the educational experience of undergraduate students bringing a fresh perspective to manufacturing and prototyping. Norvin transformed the once “off-limits to undergraduate students” fabrication shop into a student learning center. He takes a proactive approach with students, seeking to understand their true needs and help identify the best path forward. Bruns’ helpfulness extends beyond the 8-5. He responds quickly to requests by faculty – helping to design and manufacture an elbow brace for Purdue basketball center, Isaac Haas. For his ardent support of student-centered learning within the Weldon School of Biomedical Engineering, creating an atmosphere of discovery, learning and engagement through mentoring, guidance and instruction in the manufacturing design, fabrication and testing processes, Bruns received the New Employee Award. Corey Linkel, Associate Director of Undergraduate Programs, left, receives the Leah H. Jamieson Leadership Award from Leah Jamieson, Dean Emerita of Engineering and Ransburg Distinguished Professor of Electrical and Computer Engineering. Linkel serves as the Associate Director of Undergraduate Programs for the Weldon School of Biomedical Engineering. He came to the Weldon School with the goal of improving all undergraduate programs, but quickly surpassed those expectations through initiatives such as connecting senior level students with the School’s Advisory Board to advance senior design projects, instituting a guidance system for elective course selection and establishing T2M, better known as the “transfer to major” process for the college. Linkel took a proactive approach to learning the field of biomedical engineering, allowing him to offer career guidance. He also quickly established connections with new companies to expand employment opportunities. For his “out-of-the-box” thinking and intuitive approaches to building successful relationships with, and tools for, students and industry partners connected to the Weldon School of Biomedical Engineering, such as Super Friday and the Co-Op program, Linkel received the Leah H. Jamieson Leadership Award.